13-Sep-2018 -- This is the second out of 3 reports reaching confluence points in Italy’s regions Umbria, Marche, and Emilia-Romagna during my 4-day bicycle trip. The story continues from 43°N 12°E. It is remarkable that this confluence point has only been visited once back in 2001. No revisits have been taking place for 17 years! I guess that the reason for such low number of visits is the remote location and missing access to the road network that makes a hike through thickets necessary. 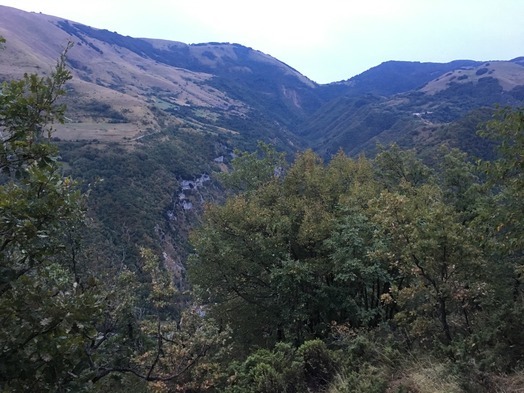 I approached the confluence from the west, where I had to cycle over a 1200 m high mountain pass and then coast down with 17% grade to Monte Cavallo – a village that is only 600 m from the confluence as the crows fly. But the view towards the confluence shows that the confluence cannot be reached directly. A steep, almost vertical rockface hampers such direct approach. It was obvious to first take the mountain road to the village Cesure. When I was approaching the village a car stopped and the driver told me in Italian that there is nobody and that it is a dead-end. Although I don’t understand the Italian language, the meaning of his words were quite clear. And indeed, the village Cesure made a deserted impression to me. According to the official statistics there are only 3 people living in the village – all are above 74 years of age. I abandoned my bicycle at the western end of the village in 750 m distance to the confluence point. I fished around for a trail for quite a while, but didn’t find anything. Eventually, I simply had to begin a direct approach – the sunset was just 40 minutes away. Above all, a thunderstorm with pouring rain occurred. It had been sunny and hot all day with temperatures above 30°C, but now it became wet and cold. Normal people would have turned around and started an approach the next day. But the next hotel was far away and I like challenges like this – so I commenced the wet hike through the dense vegetation along a steep valley slope. I knew that the confluence was higher than my starting point so I slightly ascended while hiking towards the confluence. Equipped with sandals, it wasn’t easy to move forward quickly. I stumbled through the thickets feeling the pain from the thorny juniper on my legs and arms. Partially the going was quick as some parts can be covered on meadows, but some parts of the hike were really slow going. Finally, after 30 minutes of bush fighting, I reached the confluence just 5 minutes before sunset. But due to the weather it was almost too dark to take sharp pictures. The terrain at the confluence is steep – I was able to see the lights of Monte Cavallo directly below. The vegetation at the confluence is manifold with oak, juniper, beech and pine. After the visit I realized another problem: nightfall would come quickly and I was still in the middle of nowhere. In the rush I had left my torch with the bicycle. However, making use of the last bits of daylight I returned to my bike. Then I coasted down to Monte Cavallo and 18 km further down at the river Chienti and Lago di Polverina I found a hotel near the village Polverina. Exhausted but happy I was treated with self-made pasta and a local beer. Vegetation: oak, juniper, beech, pine. The story finishes at 44°N 12°E.